Møte – Kjemi-Nytt — Kva skjer ved Kjemisk@UiB.no? 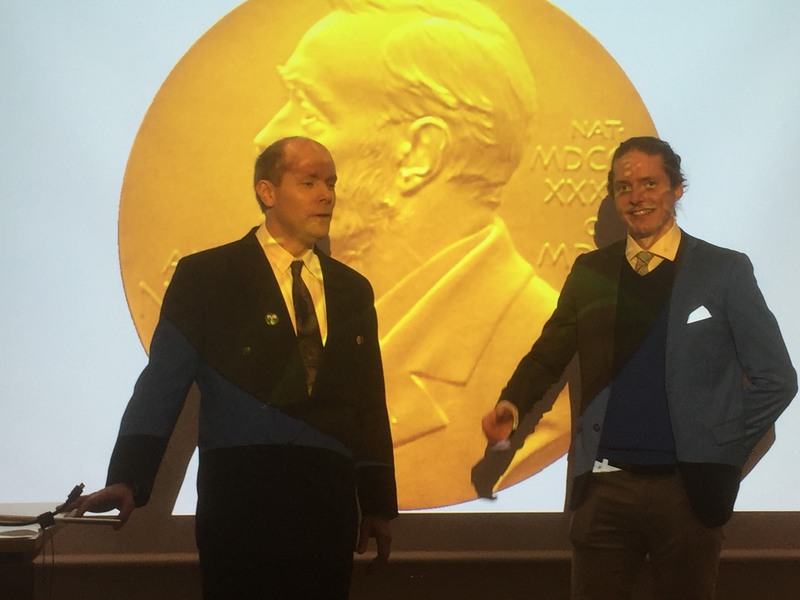 The traditional annual Nobel Prize Party, organized by the Bergen chapter for the Norwegian Chemical Society, was very successfully held last Friday. This year the Nobel Prize in Chemistry was divided, one half awarded to Frances H. Arnold «for the directed evolution of enzymes», the other half jointly to George P. Smith and Sir Gregory P. Winter «for the phage display of peptides and antibodies.» Prof. Torgils Fossen, gave a very well-prepared and insightful lecture on the subject of this year’s Nobel prize. After the lecture it was party time with seafood, refreshments and good company counting chemists at all ages from bachelor and upward. In case you missed the event, be on alert next year when it comes around! nkjkb, november 30, 2018. Category: Hendingar, Møte. Time and place: Friday June 15th at 13:15 in K3@BIO. Mike Jetten and his team have provided significant discoveries about the role of anaerobic bacteria in the global nitrogen cycle (anammox) and nitrate-dependent methane oxidation.The anammox bacteria can convert nitrogen compounds into dinitrogen gas without oxygen.This process is highly beneficial to the development of sustainable waste water treatment. Anammox has therefore been implemented in sewage treatments plants worldwide. nkjkb, juni 12, 2018. Category: Informasjon, Møte. 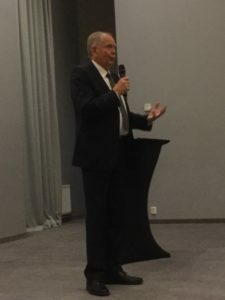 After two days filled with modern chemistry, fond memories and about 80 participants paying tribute to professor Leiv Kr. Sydnes and his many contributions to chemistry, university and society, it is easy to conclude that the symposium has been a great success. Pro-Rector Margareth Hagen set the stage in the beautiful University Aula with her inspired opening words on Tuesday, nicely followed the highly acclaimed Audun Kayser reciting four pieces of Grieg. Leiv’s first PhD graduate, professor John Sigurd Svendsen, UiT, took the audience along for a most impressive and capturing journey that combined chemistry and entrepreneurship, and from there on one inspired lecture followed after the other, until professor Magne O. Sydnes, UiS, gave the last one today, titled Chemistry in the Sydnes Laboratories. Somewhere in the middle there was a very nice evening dinner, with speeches held and presents given, by profs. Yngve Stenstrøm, Trond Vidar Hansen, the fore-mentioned pro-rector, our dean, and quite a few others. 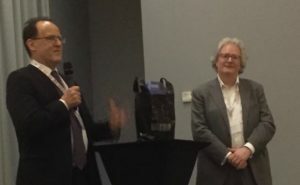 The event was very well initiated and organised, thanks due to Hans-René Bjørsvik, Bengt Erik Haug, Bjarte Holmelid, Ole Heine Kvernenes, Marit Kristin Leiren and Stig Valdernes. nkjkb, mai 16, 2018. Category: Hendingar, Møte. Ansatte og ledere ved UiB ønskes velkommen til frokostseminar 31. mai. 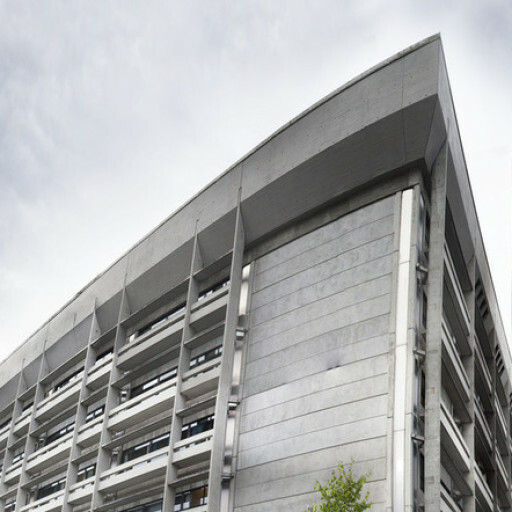 Vernetjenesten ved UiB ønsker å skape en arena ved UiB der vi kan ta opp betydningen av arbeidsmiljø. Vi vil invitere til frokostseminarer for å snakke om arbeidsliv og arbeidsmiljø under endring og omstilling. Målgruppen er alle ansatte og ledere. Det første frokostseminaret arrangeres torsdag 31. mai kl. 0830-1000 i nytt odontologibygg, Årstadveien 19, 1. og 2. molar. Temaet er *Fleksibel – digital – fremtidsrettet * – Hvordan tar vi vare på arbeidsmiljøet i et mer effektivt, fleksibelt og digitalt arbeidsliv? Et godt arbeidsmiljø kjennetegnes av god ledelse, medvirkning fra ansatte og tydelige organisatoriske rammer. Kompetanse, mestring og anerkjennelse gir både trygghet og trivsel. Dørene åpner kl. 0800 og frokost serveres fra kl. 0815.
nkjkb, mai 9, 2018. Category: Informasjon, Møte. Norsk Kjemisk Selskap – NKS- har som formål «å virke for kjemiens fremme i samfunn, vitenskap, teknikk og undervisning, samt å representere norske kjemikere og ivareta deres faglige interesser». Verksemda blir leia av Hovudstyret, men det er Rådet som har øvste mynde. Det årlege rådsmøtet er dermed den avgjerande instansen i NKS, og for 2018 fann dette stad sist fredag. 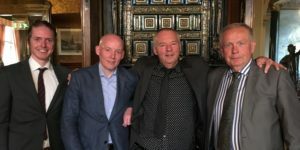 Bergen og UiB var godt representert ved Camilla Løhre samt firkløveret på biletet: Audun, Bengt Erik, Olav og Leiv Kr. NKS var ei drivande kraft i markeringa av det internasjonale kjemiåret i 2011, og vi ser fram til ei tilsvarande synleggjering av kjemifaget i samband med feiringa av det internasjonale året for periodesystemet, 2019, 150 år etter at Dmitrij Mendelejev konstruerte det første periodesystemet. Vi siterer IUPAC: In proclaiming an International Year focusing on the Periodic Table of Chemical Elements and its applications, the United Nations has recognized the importance of raising global awareness of how chemistry promotes sustainable development and provides solutions to global challenges in energy, education, agriculture and health. Dette er ein lissepasning til NKS i deira arbeid for kjemiens fremme i samfunn, vitenskap, teknikk og undervisning. nkjkb, mai 9, 2018. Category: Hendingar, Informasjon, Møte. 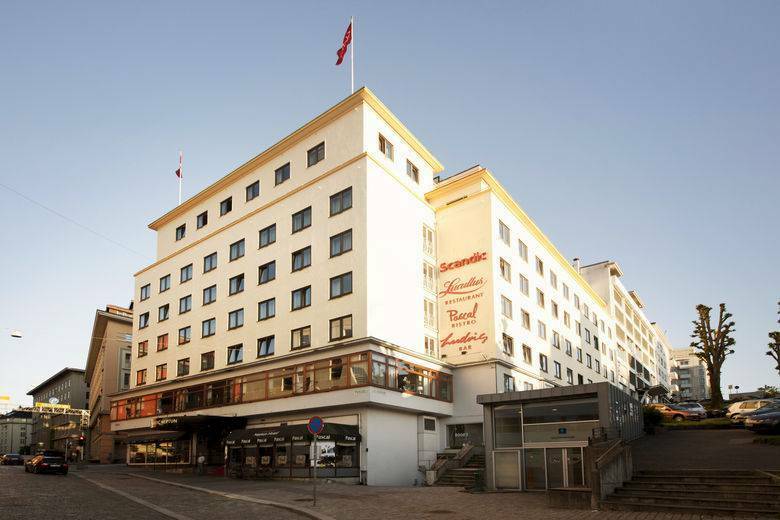 The nanoscience network in Bergen, nanoBergen, had an interesting and successful meeting at Hotel Neptun last Thursday. The interdisciplinarity of this research field was evident by the attendance and contributions to the meeting. The departments of physics and technology, biology, clinical dentistry, and chemistry from UiB were all represented. There were also representatives from Western Norway University of Applied Sciences present. From industry we had visits from the local companies EnSOL AS og Joma International AS. Additionally, we had a very interesting presentation and introduction to the “SFI Smart Ocean. Initiative for new Innovation Centre” by Jon Hellevang from GCE Subsea. nkjkb, desember 1, 2017. Category: Hendingar, Møte. …how Bjørn Grung found himself here? 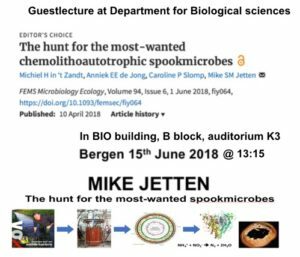 For the answer, attend the Thursday lunch seminar this week at 12.15 @Tripletten. Welcome! nkjkb, november 15, 2017. Category: Møte. Early this year, the department got new instrumentation for flow chemistry. In the lunch seminar this week, Audun will give an introduction to the new technology, in his lecture over the self-chosen topic Enabling technologies: Flow Chemistry. 4D coordinates: Thursday Oct 5 at 12.15, at Tripletten (3069). nkjkb, oktober 4, 2017. Category: Informasjon, Møte. Do not miss the opportunity to hear Dr. Ralf Kellmann (Dept. of Biology & Hormonlaboratoriet HelseBergen) tell about their effort to use of synthetic biology to produce neosaxitoxin. Neosaxitoxin is one of the paralytic shellfish toxins (PSTs), which are a group of neurotoxic alkaloids produced by algal blooms, i.e. marine dinoflagellates (red tides) and freshwater filamentous cyanobacteria. PSTs reversibly block voltage-gated sodium channels, and recent clinical trials on humans have indicated a positive safety profile for neosaxitoxin as a long-acting local anesthetic. The major challenge with neosaxitoxin and its relatives is the lack of a large-scale production process. We are employing synthetic biology to develop such a large-scale production process for neosaxitoxin, which we envision will be capable of covering the future world-market demand for neosaxitoxin. Synthetic biology can be defined as: » the design and construction of novel biological pathways, organisms or devices, or the redesign of existing natural biological systems» (UK Royal Society). It is one of the currently fastest growing research fields, enabled by new technologies, such as the chemically synthesis of long (> 100 kb) DNA, and efficient combinatorial cloning techniques. 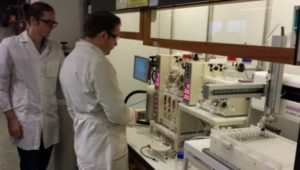 Synthetic biology can be used as a research tool to uncover and characterise novel biochemical pathways, as well as to develop processes for the industrial production NPs and NP-derived derived drugs. When and where: Thursday Sept 28 at 12.15 in Tripletten. nkjkb, september 27, 2017. Category: Informasjon, Møte.